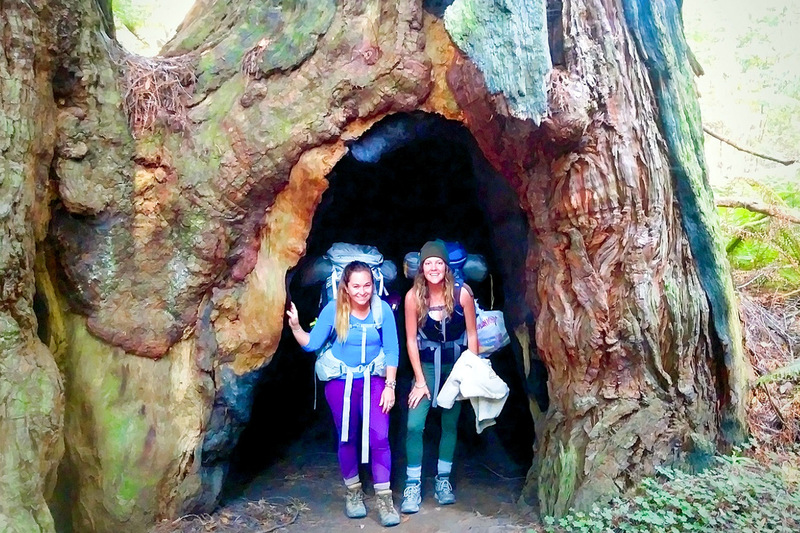 GAINESVILLE, Fla. – The first time 27-year-old Ashley Nicolls visited Redwood National Park in California, she cried from excitement. Nicolls always knew she was meant to be outdoors. She’s traveled to 41 states and visited countless national parks. But it wasn’t until she tried out three majors and three schools that she found her true calling in environmental management in agriculture and natural resources. After earning an associate’s degree in marine biology from Florida State University, Nicolls dabbled in business and communications classes. Finally, she found her passion in two courses in wildlife and hydrology at the community college in her hometown of Palm Beach Gardens. Nicolls then knew she was ready to return to school after a yearlong hiatus. She applied to UF in 2015, but there was one setback — she was living in Buenos Aires, Argentina, at the time. After traveling there for a short vacation, Nicolls had fallen in love with the city. Instead of moving to Gainesville, Nicolls was able to stay in Argentina and pursue an environmental management degree in the UF/IFAS College of Agricultural and Life Sciences through UF Online. While taking courses, Nicolls would wake up every morning and go for a five-mile run. She loved changing up her routes to see a different part of the city every day. Afterwards, she would visit the pastry shop next door to her apartment to enjoy a fresh-made croissant. Nicolls appreciated that her virtual classes accommodated her schedule so that she could not only explore the area, but also work. When she wasn’t doing homework, Nicolls spent her time teaching English to children. The flexibility to do her classes whenever she wanted allowed her to create a routine — she would do all of her coursework in the mornings, take an hour-long bus ride to the children’s houses, then spend the afternoon tutoring them in English after they got out of school. On the weekends, she also worked with the city’s agricultural department to help revamp local parks by planting trees and cleaning up nature trails. After moving back to Florida in February 2017, Nicolls continued to take advantage of the flexibility of her online courses by interning at Jonathan Dickinson State Park in Hobe Sound, FL. Nicolls shadowed the park biologist and helped with park duties, such as testing the water, trapping hogs, and conducting research on plant genetics. While working 25 hours a week at the state park and 40 hours a week as a waitress at a restaurant, Nicolls used the time in between to complete her bachelor’s degree. Nicolls was glad she was able to take courses in tandem with her internship. She felt that the material she was learning in class applied to the tasks she was doing out on the field. Her coursework paralleled her responsibilities at work and gave her the confidence and knowledge to communicate on the same level with her peers. 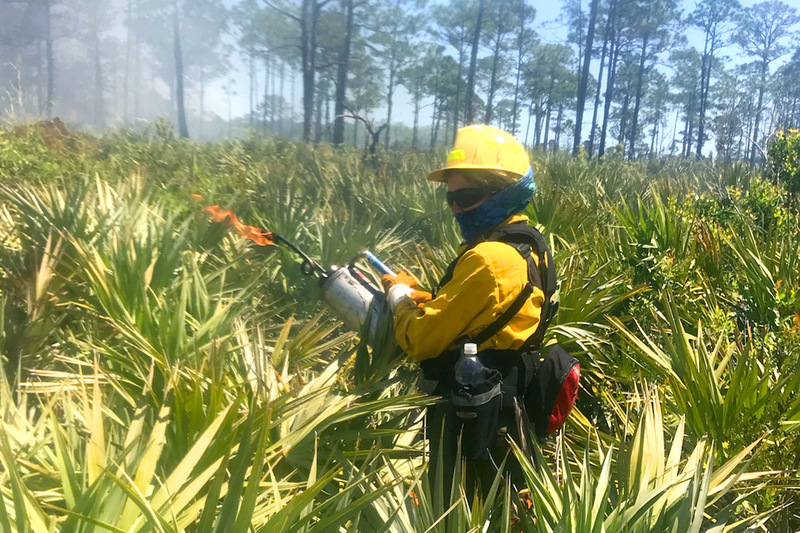 Nicolls graduated in Spring 2018 and is working part-time at Jonathan Dickinson State Park as a fire technician. She hopes to gain more experience before going back to school for a master’s degree and ultimately working as a biologist at a national park. 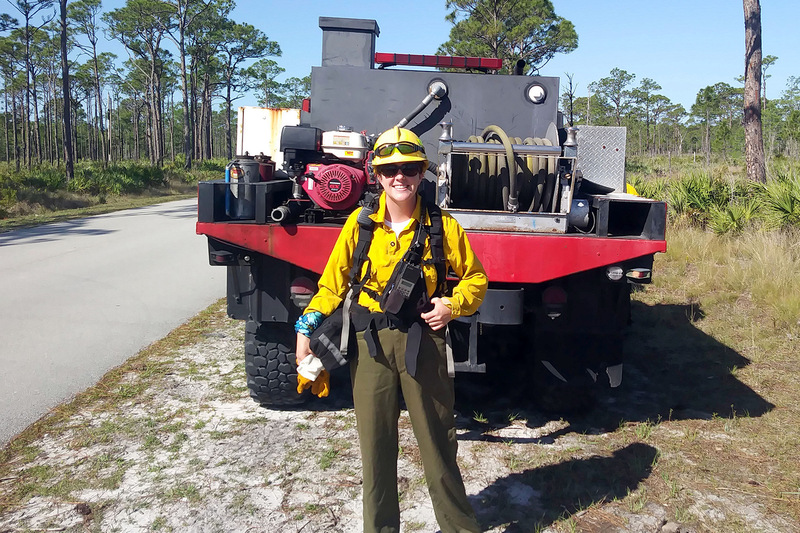 Ashley Nicolls became a certified fire technician while interning at Jonathan Dickinson State Park in Hobe Sound, FL. 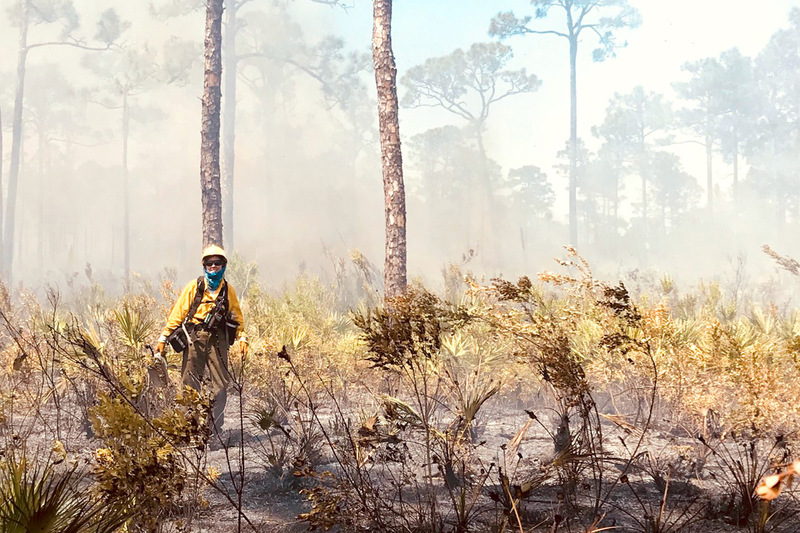 Nicolls completes a prescribed fire in Jonathan Dickinson State Park in Hobe Sound, FL. Nicolls hopes to use her environmental management degree to become a national park biologist. 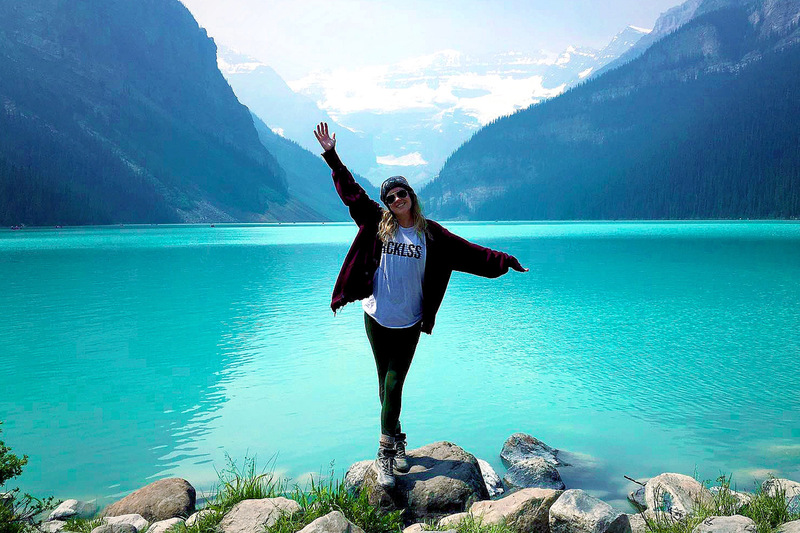 Nicolls visits Lake Louise in Banff National Park in British Columbia. Story by Alexandria Ng. Photos submitted by Ashley Nicolls. With an online environmental management degree, you can make an impact on the well-being and health of our planet and its people. Learn from UF faculty in the College of Agricultural and Life Sciences and begin shaping a sustainable future. Ranked among the top 5 online undergraduate programs in the nation by U.S. News and World Report, UF Online offers 21 majors across a variety of disciplines, seven minors, and dedicated academic advisors to help students design their own academic pathway. Degree programs are continually being added. Visit our Degrees page to learn more about our degrees. Apply now and start your journey to graduation.